As compared to 1909 Lincoln Wheat Penny coins, Pennies from 1910 are far more common and are much less valuable than their 1909 counterparts. Gone, too, are the VDB initials that caused a stir when the Lincoln Cent was first released in 1909. In fact, the VDB initials wouldn’t reappear on the Lincoln Cent until 1918, when the three numismatically famous letters would be placed under Lincoln’s shoulder. The 1910 Lincoln Wheat Penny coins were minted at the Philadelphia and San Francisco Mints. The San Francisco Mint used an "S". The main Mint in Philadelphia did not use a mintmark. 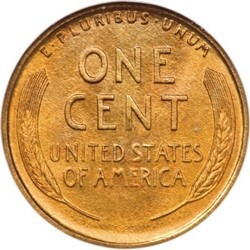 As mentioned earlier, 1910 Lincoln Cents are more common than 1909 Pennies in general, but that doesn’t mean they are all worth only one cent. Even a well-worn 1910 Lincoln Penny (without a mintmark) is worth between 25 and 50 cents. The 1910-S Lincoln Penny has a value of $15 to $20 in the lower circulated grades; the higher value of the 1910-S Lincoln Penny is attributed to the fact that only 6,045,000 were made, as opposed to the much higher 146,801,218 figure for the 1910 Lincoln Penny. There are no major noted varieties for 1910 Lincoln Pennies, but there were 4,118 proof Lincoln Pennies struck. These early proof coins have a matte appearance and are usually only distinguishable from regular strikes by their squared-off rims and overall sharp details. Proof Wheat Penny coins from 1910 are not brilliant like today’s proofs, and are usually brownish in color.